Our species is not unique for stealing another species milk, but we certainly do it on a scale unsurpassed by any other. But milk stealing and milk sharing is common between members of the same species and the subject of very much conjecture. Why would a female tolerate another mother’s young stealing her milk? Lactating and nursing is a major investment by mothers in their offspring. Milk is nutrient-rich and imposes extreme demands on the mother. It seems intuitive, therefore, that mothers should be very careful to make sure their offspring benefit from their milk and none is wasted. For the same reason it seems intuitive that young should try to steal milk from other mothers. Offspring can have an insatiable appetite or their own mother might not produce enough. Either way being able to sneak some extra from a mother that is not your own would be a useful skill. We should not be surprised, therefore, that milk stealing is common in amongst mammals. We should be surprised, however, if mothers tolerate it, and dumbfounded when they encourage it. SURPRISE! – the mothers of many species are known to provide milk for young that are not their own and it is called allonursing. In human communities allonursing is called ‘wet nursing’ – still widely practiced and once more common in western societies. Allonursing is also common amongst ungulate species, especially those that typically live in family groups where females live and raise their own offspring with their mothers or sisters. To scientists that call themselves behavioural ecologists allonursing is interesting because it appears prima facie to contradict their expectation that the behaviour of animals exists because it improves the individual’s fitness – in this case of the mother. Why would a mother waste milk on another mother’s young when her own might benefit from it? 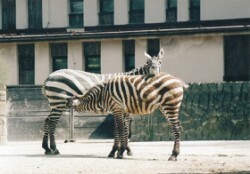 Nursing and allonursing at the same time in captive plains zebra at Dvůr Králové Zoo. Source: http://www.sciencedirect.com, Dr Jan Pluhácek et al. Although allonursing is common in some ungulates, it is rare amongst the asses, horses and zebra. Allonursing in the equids has only been observed in a ‘handful’ of cases worldwide and only after a mother has adopted another mother’s offspring – sometimes because the first mother has died or one of two mothers’ offspring died. Allonursing has also not been described in rhinoceros and tapir – although this might just be because these species are difficult to observe in the wild and less common in zoos. So rare is allonursing in the equids that the circumstances of its exceptional occurrence have been used to try and understand why allonursing might have evolved to be more common in other species. It seems sensible that it was once also unusual in some other species but, for reasons unknown, became more common. For example, when allonusing occurred in Kaimanawa feral horses  it was in the unusual circumstance that a filly and her mother dispersed into a new breeding group together – ordinarily both female, as well as male, offspring leave their mothers for a differnt breeding group. Both mother and daughter foaled around the same time but one of the foals died and both adopted the live foal. We used this unusual occurrence to conclude that allonursing might be more common in horses if females lived with their mothers and, by implication, the potential for kinship to be important for the occurrence and evolution of allonursing. A recent study in the Journal of Zoology (London) updates our understanding of allonursing in the equids, especially zebra . The authors are a new and interesting collaboration. Dr Jan Pluhácek has a suite of previous publications on the maternal behaviour of equids from his detailed measurements involving thousands of hours of observation, especially of zebra at Dvur Králové Zoo, Czech Republic, where he did his Ph.D. Dr Sarah King is known for her work on the ecology of Przewalski’s horse in Mongolia. She is now a post-doctoral researcher interested in small mammal ecology and biodiversity at the University of Colorado.The lead author Michaela Olléová is new to work with the Perissodacyla but with a growing publication list. 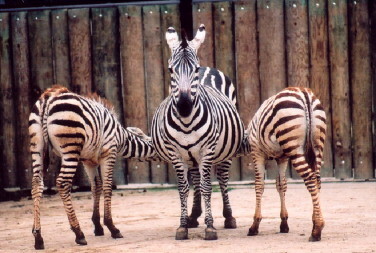 The authors compared the rate of allonursing by three different zebra species: plains, mountain and Grevy’s zebra, in the Dvur Králové Zoo. Although the work is on captive populations which might have higher rates of allonursing, the authors’ comparisons of the zebra species are informative. All the Grevy’s zebra foals attempted to suckle from another mare and most were allowed by the mothers but attempts by mountain or plains zebra foals were rare and never successful (although note allonursing in plains zebra from previous study – see image above and study). Interestingly, allonursing commonly occurred when the Grevy’s zebra mother was also nursing its own young. Although the rate at which attempts to allonurse were tolerated was low (10% cf. 59-74% of attempts for offspring) they were sufficient for one foal orphaned at six months to survive beyond weaning – remarkable. Grevy’s zebra mares appear to be more tolerant of other foals nursing from them. When plains and mountain zebra mothers rejected an allonursing attempt they did so with a kick, whereas Grevy’s zebra mothers were just as likely not to kick but simply move away from the foal. Grevy’s zebra are regarded as an arid-adapted equid and many have explained its different behaviour from other zebras in this way. But if adaptation to arid environments influenced allonursing then Grevy’s zebra mares should be less, not more, tolerant of allonursing – the water and nutrients of milk should be more valued and defended, not less. I agree with the authors – the arid-adapted hypothesis for allonursing is flawed . The authors discuss, instead, how allonursing in Grevy’s zebra might be explained by their different social system from other zebra. Plains and mountain zebra form stable groups of mares but Grevy’s zebra do not. Thus, attempts to steal milk would be less common in Grey’s zebra and a temporary cost even if successful. If plains and mountain zebra mothers, however, tolerated allonursing they could suffer high rates of milk theft. The rationale, therefore, is that there has been selection for intolerance of allosucking in plains and mountain zebra, but not Grevy’s zebra. I like this argument because the authors have flipped the question ‘on its head’ and asked ‘why not allonursing?’, rather than ‘why?’. One aspect of the study which leaves me unsatisfactorily guessing is the relationship between the allonursing mothers. Although the authors did not find more related mothers to allonurse more related offspring, they did find a relationship between maternal kinship and allonursing. Unfortunately, the authors do not say whether kin were more or less likely to allonurse. If kin were more likely to allonurse each other’s offspring the authors’ conclusion that the relationship of mothers is not important seems premature. If females were more likely to allonurse the foals of their mothers, sisters and daughters it would confirm my suspicion that mother-daughter or sisters relationships are important to the occurrence and evolution of allonursing that is ordinarily prevented by female dispersal in equids. I will follow this up with the authors for clarification and perhaps discuss it in another post. I am not convinced yet, therefore, of the authors’ conclusion that allonusing might be maternal reciprocity – a sort of ‘I’ll nurse your young if you nurse mine’ arrangement. The problem with the reciprocity hypothesis is that a mare whose foal allonurses from another mare, conveniently near by, might also have excess milk and become more tolerant of the other mare’s foal also allonursing. One does not need to add reciprocity to explain why a mare would defend her milk less when she has more. It might be uncomfortable, even painful, to have a full udder. My recollection of cows late to the milking shed was of their bellows of discomfort as they arrived and how they lowed with relief as their udders were emptied. The authors are careful, however, to point out that they cannot dismiss other hypotheses for allonursing including that the mare may just want to get rid of her milk. Nevertheless, I agree with the authors’ summation – equine social systems are likely to have influenced the pattern of allonursing behaviour in the zebra species. There are limitations to the sorts of maternal behaviour and investment studies like the one described because they do not actually measure the amount of milk received by the foal. It is understood that the time or frequency of nursing by offspring does not correlate reliably with the amount of milk it receives for an enormous number of reasons , even in equids where foal suckling is so easy to observe . Sometimes suckling for longer and more often can mean the foal is getting less, not more, milk, especially if the mother is producing less milk or not ‘letting it down’. Some suckling is also just for young animals’ comfort. It remains possible that much of the allonursing in Grevy’s zebra does not yield milk, or at least not as much milk as the mothers own foal would receive. The next step in this research should be measurements of the milk transferred – it would be fascinating and provide more direct estimates of allonursing. Unfortunately, the opportunities for more detailed work to measure milk transfer is limited in the zoo environment. Does anyone have a captive population of Grevy’s zebra females where milk transfer could be measured? I suspect the authors would like to hear from you. 1 A case of co-operative nursing and offspring care by mother and daughter feral horses. Cameron, E.Z., et al. (1999) Journal of Zoology 249, 486-489. 2 Effect of social system on allosuckling and adoption in zebras. Olleova, M., et al. (2012) Journal of Zoology 288, 127-134. 3 Adaptive explanation in socio-ecology: lessons from the Equidae. Linklater, W.L. (2000) Biological Reviews of the Cambridge Philosophical Society 75, 1-20. 4 Is suckling behaviour a useful predictor of milk intake? A review. Cameron, E.Z. (1998) Animal Behaviour 56, 521-532. 5 Suckling behaviour does not measure milk intake in horses, Equus caballus. Cameron, E.Z., et al. (1999) Animal Behaviour 57, 673-678. © Wayne L. Linklater and Perissodactyla, 2012. Unauthorized use and/or duplication of this material without express and written permission from this blog’s author and/or owner is strictly prohibited. Excerpts and links may be used, provided that full and clear credit is given to Wayne L. Linklater and Perissodactyla with appropriate and specific direction to the original content.